March 23, 2012 – PRESS SUMMARY – PENTAX RICOH IMAGING AMERICAS CORPORATION announced the introduction of its new DA645 25mm f/4 lens, designed and optimized for exclusive use with its popular 645D medium format digital SLR camera. By combining its ultra-wide perspective with exclusive PENTAX Super Multi-Coating (smc), Aspherical Elements (AL), Supersonic Direct-drive Motor (SDM), and all-weather (AW) construction, PENTAX has created a lens that will render super-sharp images with performance levels photographers have come to expect from original PENTAX lenses. When mounted on the PENTAX 645D medium-format digital SLR camera body, the DA645 25mm f/4 AL [IF] SDM AW lens provides a focal length of approximately 19.5mm in the 35mm format, the widest perspective available with the 645D. Photographers now have greater creative flexibility when shooing landscapes or when photographing in confined areas with minimal room to move. As with any quality optics, precision engineering and glass elements are critical ingredients. The DA645 25mm f/4 lens incorporates two high-performance aspherical optical elements, which provide exceptional image-resolving power with outstanding brightness levels even at the edges, while keeping various aberrations to a minimum. In addition, the lens is treated with PENTAX Aero Bright Coating to ensure an outstanding anti-reflection performance over a broader wavelength range to deliver images that are more brilliant and higher quality than those produced by previous models. Additional lens coatings and anti-reflective materials are applied to create a lens that is totally optimized for the 645D camera. As the newest addition to the AW (all-weather) series, this new lens includes dustproof and weather-resistant construction with 11 special seals to prevent the intrusion of dust and water into the lens interior. 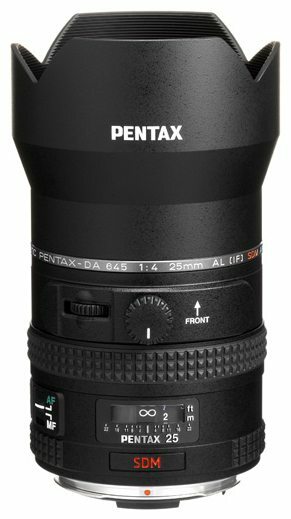 By coupling this lens with the PENTAX 645D camera body, photographers can be assured they are using a durable and reliable digital imaging system that performs superbly in demanding outdoor settings where water, rain, and dust can be prevalent. The new DA645 25mm f/4 lens features a conveniently placed interchangeable built-in filter holder (including a 40.5mm diameter circular polarizing filter) located within its barrel. The lens also features fully automatic diaphragm control; a built-in lens hood optimally shaped for its angle-of-view when used with the 645D; a Quick-shift Focus system for instant switching between auto and manual focus; and a Special Protect (SP) coating applied to the front surface of the lens to repel, dust, water, and grease. In addition, the lens incorporates an advanced SDM (Supersonic Direct-drive Motor) autofocus mechanism to ensure smooth and quiet autofocusing, as well as a rounded diaphragm to produce an attractive “bokeh” for enhanced appearance of a photograph’s out-of-focus areas. The new Pentax DA645 25mm f/4 lens will be available at retail outlets nationwide and online in late March with a suggested retail price of $4,999.95.